Who would have thought, Aquaman (2018) directed by James Wan was able to amaze the attention of the whole world. He was keen to form this movie according to his taste, and from here the atmosphere of DC changed, DC Comics which was previously in a dark zone, is now full of color and made more humane. When telling superheroes, maybe you will compare superhero characters from Marvel and DC, both of which are clearly different. For this reason, I will not compare this movie with the phenomenal The Dark Knight or The Dark Knight Rises, especially comparing it to the Marvel Cinematic Universe, because obviously, they have different flavors, each of which has its own uniqueness and advantages. Well, AQUAMAN, a movie released in 2018 I have watched many times, first I watched this in Cinema XXI, then I rent a DVD to watch it more than 3 times. I enjoy the visual effects graph once, and a long story neatly wrapped, both on land and in the depths of the Atlantic ocean. Tells a story about a man named Arthur Curry (Jason Momoa), a man born from the marriage of an ordinary human lighthouse guard named Thomas Curry (Temuera Morrison) with an underwater goddess Queen Atlanna (Nicole Kidman), has determined a new destiny, that “underwater human” which is full of strength and advanced technology, can unite with ordinary people who live on land. Exciting stories began, then Arthur Curry had super powers and a wise heart. He is able to fight on land and in the deep ocean. You might wonder, it doesn’t make much sense if ordinary people can live underwater and can breathe like fish, more extreme, they talk in water. How did this happen? This story begins when an advanced island of Atlantis has advanced technology that makes the country powerful, and over time, a new source of power has been discovered. They tried it, but it failed. That failure has made the island of Atlantis was swallowed by the ocean, and then the power released by the mysterious source gives a new evolution to the inhabitants of Atlantis. That mysterious power makes them able to breathe and live in the ocean. In addition, they built sophisticated cities in the ocean, developing and full of technology just like when Atlantis was still on land. This is the reason for science fiction presented to us. Make sense. Ordinary humans can betray, and gods are busy with the throne of their kingdom. That’s how the greeting describes the two enemy figures from Aquaman. On land, Aquaman finds an enemy named Black Manta (Yahya Abdul-Mateen II), who wants to take revenge because of Aquaman has killed his father in a submarine. In addition, Black Manta has also become of Aquaman’s enemy in Atlantis, and he is also equipped with a sophisticated weapon that can turn seawater into deadly plasma rays. This is his flagship weapon to defeat Aquaman, he has remodeled the weapon from a rifle into a large eye that can emit plasma rays. 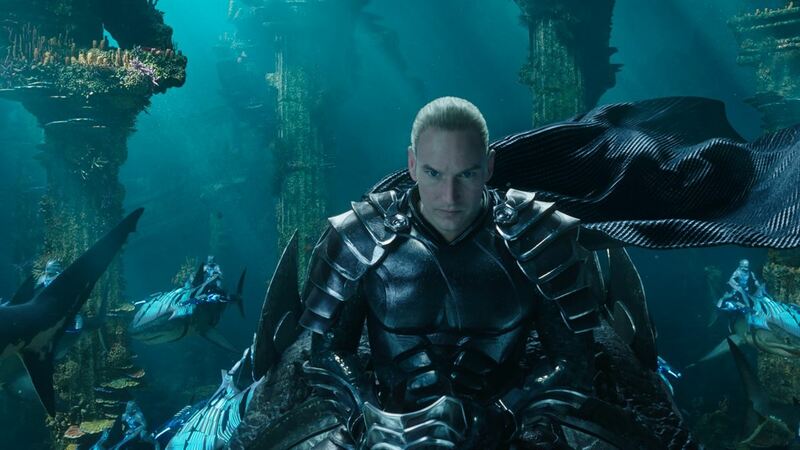 Finished with Black Manta, we turn to Orm (Patric Wilson), who dubbed himself the Ocean Master. Having become the king of Atlantis and not wanting to accept land people, because human waste has polluted the ocean, he echoes the war against humanity because of that. He also wanted the immortality of the underwater royal throne. In contrast to his siblings, Arthur, wished to unite the two worlds, according to their mother’s message. As we know, before the first film of Aquaman was released, we have seen him in the Justice League (2017), and of course, it has become a new scene in DC Comics, which has made us curious. With Aquaman 2018, the curiosity has been answered, and I still want to watch Jason Momoa’s action in this sequel. Well, at the end of the movie, Black Manta is said to still be alive, aided by an Asian technologist, this is a clue, whether Black Manta will return to take part in the Aquaman sequel, we will enjoy it later. Benar sekali, Aquaman telah mencerahkan DC, dan DC keluar dari kotak hitam dengan penuh warna. Thanks for coming in.! Movie yang sangat luar biasa teman. Saya sudah nonton film ini dulu tapi kurang fokus saat itu jalan ceritanya, sekarang mau nonton dari awal setelah baca konten vamg mawardi. Aquaman Rocked! I found it much better than JL…. maybe it because Momoa because of his great on screen presence or maybe its the whole story that I liked….. It looks like a ripping yarn. Thanks, Mawardi. I am going to watch the movie. Thanks.